Plastikoil spiral binding equipment, plastic coil binding machines, 1 (800) 665-7884. Plastic coil book binding systems. Outside North America call 1 (204) 663-9214. Punching Equipment – Gateway Bookbinding does not manufacture any punching equipment ourselves but we are very confident in the machines that we carry. These machines have been proven reliable. The PBS 340 Electric Table-Top Punch is ideal for the low to mid-range volume workload. 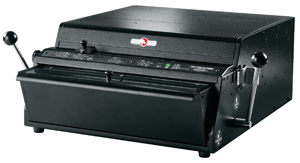 Foot pedal operated with vertical paper feed provides for comfortable, convenient operation. Low maintenance. A very solid reliable table-top machine. The HD7700 is a very solid, heavy duty table-top unit that offers interchangeable quick change punch dies. Ideal for a mid-range volume environment. A 14 inch die that's open-ended to allow for double punching of larger sheets. 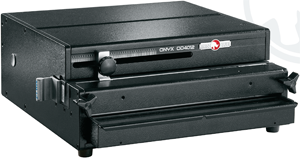 The OD4012 is an 11-inch open-ended punch that features the EZ Die Change system. Quick and easy setup with easy pin pulls and preset paper stop positions. The PBS 360AE Punch offers table-top convenience with the added benefit of hands-free auto paper ejection. Incredibly affordable! 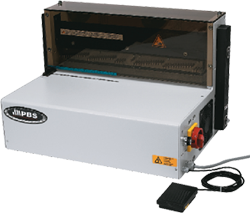 The PBS 500E Semi-Automatic Punch offers industrial capabilities with small footprint flexibility. 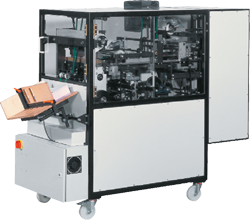 The wide 20 inch punch width, coupled with horizontal feed, enables the operator to accommodate both small and wide book formats quickly and easily. The PBS AP 360 Automatic Punch offers hands-free punching of pre-collated books, reports – it can even handle tabs. Simple and easy to changeover – the AP 360 provides top quality punching technology, delivering high levels of production, performance and economic efficiencies.